Continuing with why makeup primers may be helpful. If you have textured skin, wrinkles or fine lines it can help to create a smooth surface for you to apply your makeup on. It can fill in those fine lines and prevent makeup from getting in there. Primers prevent creasing which may be an issue if you have dry skin. They help blur out imperfections in other words. Another reason why primers are a must-have is that they create a barrier between your skin and the foundation, almost like protection and preventing skin from getting clogged up. There are so many primers on the market where some are pricier and some are on the more affordable side. 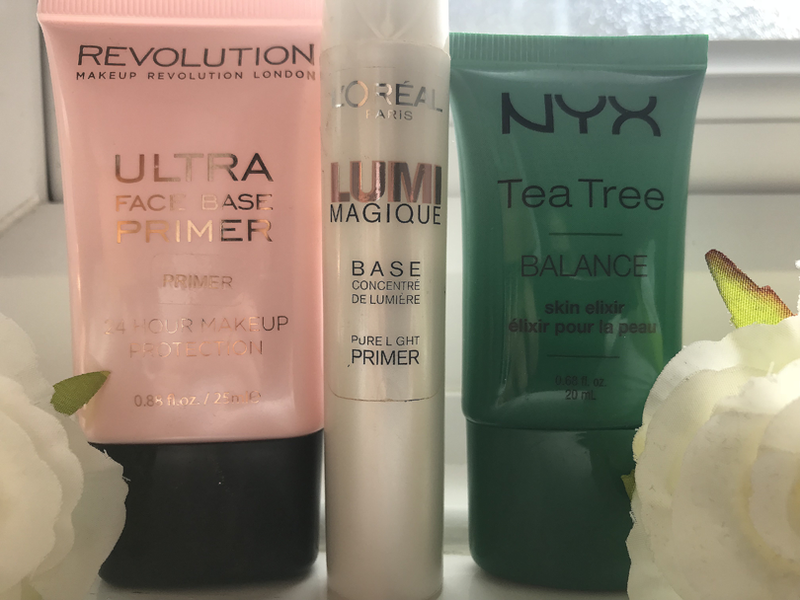 Regardless of the price, you would want a primer to do what it claims to do and these are the three affordable options that have worked for me. 1 - L'Oreal Paris LumiMagique Primer for £7.65 This is a light-concentrated primer which claims to provide 8 hours of hydration as well as illuminate the skin creating a base for the skin. It can also be used on its own. It is a silicone-based primer. Alcohol denat in this primer helps to give it a light feeling. It allows the primer to absorb into the skin. This primer is really good for people with dry skin and helps create a dewy skin makeup look but it doesn't help at all with controlling oil. If you have oily skin this wouldn't work for you. It fills in the fine lines and minimises the appearance of pores. 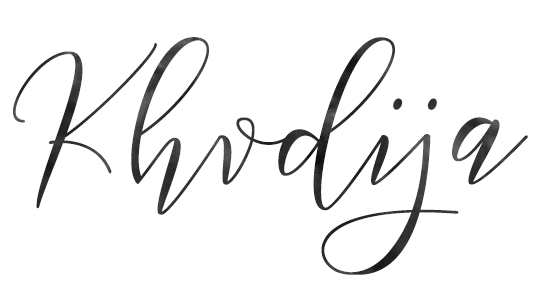 It creates a smooth, velvety base. In terms of lasting all day long, it does last for a upto 8 hours but after that it does cause makeup to start creasing. That might not be ideal but realistically I don't wear my makeup for more than 8-10 hours. This primer does create a flawless base and makes makeup application easier. For the price it is worth it. It comes in a long tube and is slim so can fit easily in your makeup bag. Pricewise, this is the second cheapest option and it is one of the most affordable which is always a plus. This primer is infused with tea tree oils and claims that it boosts balance and rejuvanates the skin making the skin feel smooth and natural. Ingredients: Water/Aqua/Eau, Alcohol Denat., Isododecane, Dimethicone/Bis-Isobutyl PPG-20 Crosspolymer, Glycerin, Butylene Glycol, Glyceryl Stearate, PEG-100 Stearate, Dimethicone, Cetyl Alcohol, Talc, Melaleuca Alternifolia (Tea Tree) Leaf Oil, Caprylic/Capric Triglyceride, Silica, Sodium Polyacrylate, Tocopheryl Acetate, Ethylhexylglycerin, Disodium EDTA, Phenoxyethanol. This primer contains tea tree oil which is really good for the skin as it has antimicrobial and antiseptic properties which helps inflammation and redness. It is good for treating acne so this primer is good for those who suffer from acne or skin problems as it can prime and help the skin at the same time. It also moisturises the skin keeping it hydrated. This is also a good primer for people with oily skin as tea tree oil absorbs oil and prevents oil production. It also contains silica which is also very good for hydrating the skin as well as slowing down the process of skin degeneration. It has anti-aging properties. Now onto the primer itself, it is especially good for oil control and it prevented the production of oils throughout the day almost giving a matte finish to the makeup. It did last all day long and I didn't notice any changes to the makeup apart from at the end of the day my t-zone would start getting slightly oily. I noticed that it was really good for my skin and would help my redness and if I would use this during the time of a skin breakout it wouldn't cause further breakouts and it would help to calm it down. It wouldn't cause my makeup to crease even if I used powders. It wouldn't emphasise my fine lines or pores but rather blurs them out. It created a perfect, flawless base for my makeup. It doesabsorb all the oil and create a drying feeling to the skin so it may not be the best for dry skin. This is the cheapest option even in comparison to the NYX primer as you get 5ml more than that one and it's the same price as that one. This primer claims to smooth out the skin and create an even flawless base which lasts all day long. One of the things I love about this primer is that it is vegan, cruelty-free and gluten-free so anybody can use this. This is similar to the L'Oreal Paris LumiMagique primer. It is a silicone-based primer and silicone is used to create a velvety texture and make your skin, even more, smoother as it fills in lines, pores, and imperfections. 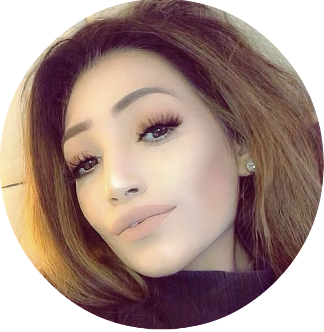 It is extremely adherent and helps your makeup cling on to the primer which is what helps the makeup last all day long as the way foundation can stick to primer, it can't stick to your bare skin the same way. It contains parabens which act as a preservative and helps the primer last preventing bacteria, fungus or anything harmful getting in. This is what makes the primer safe to use. This primer is great for a dewy finish and creates a perfect, flawless base. Completely smooths out the skin and almost makes it feel like you have another layer of skin on top acting as a barrier. In terms of oil control, it doesn't do much to prevent that. It does create a sticky base which makes it easier for the makeup to stick on to. It blurs out all types of imperfections and evens out the skin. This helps with skin texture. It prevents makeup creasing. It is perfect for dry skin as it keeps the skin hydrated. It does what it claims and the makeup lasts all day long. The only difference it makes is that the t-zone does tend to get oily after a while. 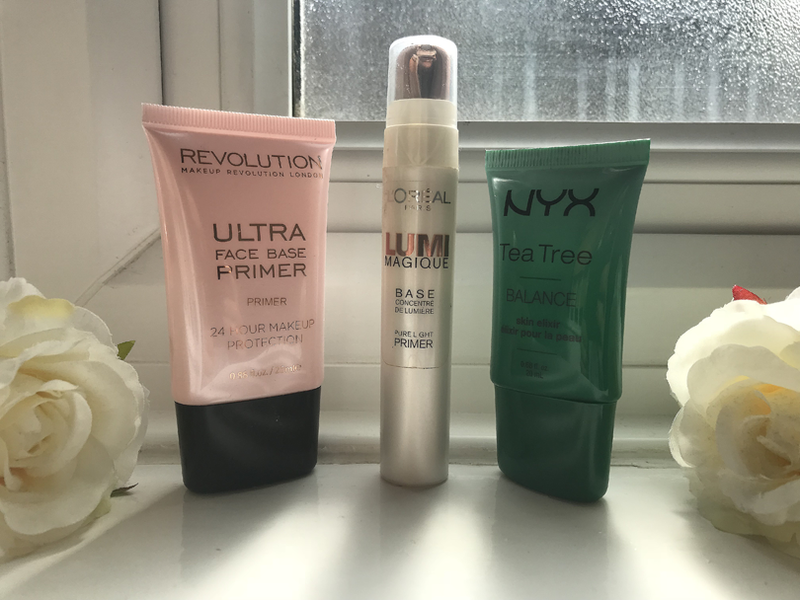 These are my three favorite drugstore primers. I hope this helps and might help you to choose a better primer the next time you purchase one. 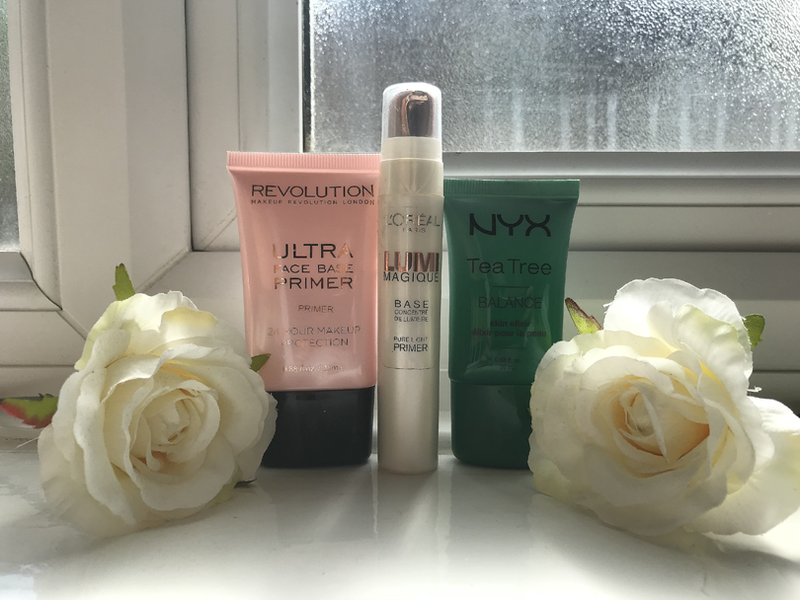 And if you're looking for affordable options these might be primers you may consider.